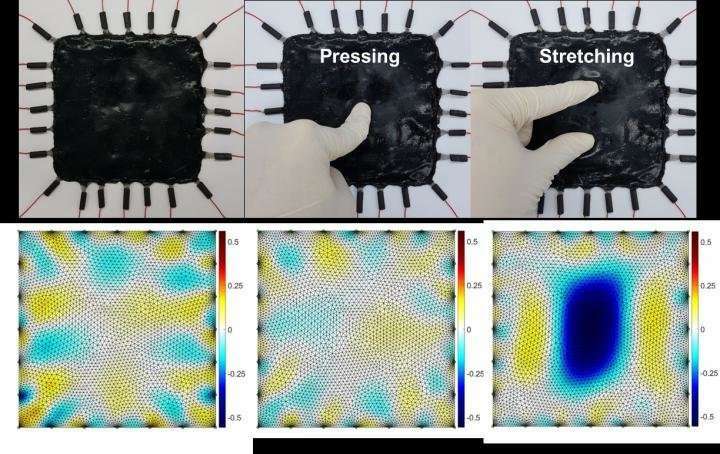 A KAIST research team has reported a stretchable, pressure-insensitive strain sensor by using a solution-based process. The process is easily scalable to accommodate large areas and can be coated as a thin film on three-dimensional, irregularly shaped objects via spray coating. These conditions make their processing technique unique and highly suitable for robotic electronic skin or wearable electronics applications. The making of electronic skin to mimic the tactile sensing properties of human skin is an active area of research for applications such as wearable electronics, robotics and prosthetics. One of the major challenges in electronic skin research is differentiating external stimuli, particularly strain and pressure. Another issue is uniformly depositing electronic skin on three-dimensional, irregularly shaped objects. To overcome these issues, the research team led by Professor Steve Park from the Department of Materials Science and Engineering and Professor Jung Kim from the Department of Mechanical Engineering developed electronic skin that can be uniformly coated on three-dimensional surfaces and distinguish mechanical stimuli. 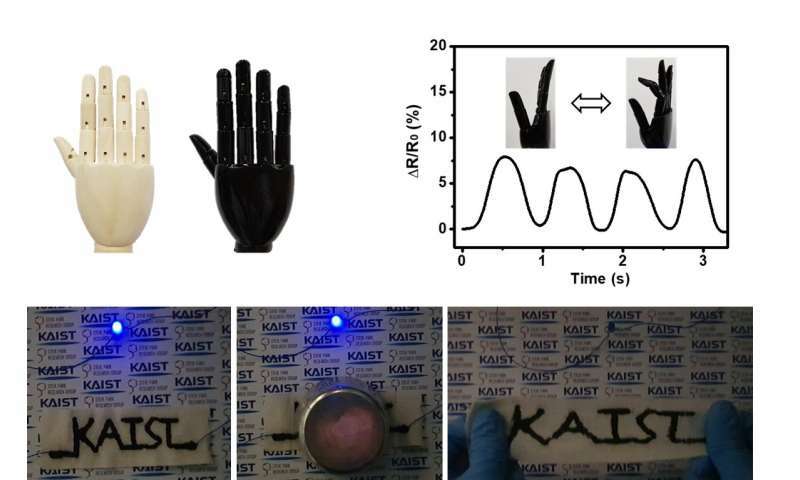 The new electronic skin can also distinguish mechanical stimuli analogously to human skin. The structure of the electronic skin was designed to respond differently under applied pressure and strain. Under applied strain, conducting pathways undergo significant conformational changes, considerably changing the resistance. On the other hand, under applied pressure, negligible conformational change in the conducting pathway occurs; e-skin is therefore non-responsive to pressure. The research team is currently working on strain-insensitive pressure sensors to use with the developed strain sensors. The research team also spatially mapped the local strain without the use of patterned electrode arrays utilizing electrical impedance tomography (EIT). By using EIT, it is possible to minimize the number of electrodes, increase durability, and enable facile fabrication onto three-dimensional surfaces. Professor Park said, "Our electronic skin can be mass produced at a low cost and can easily be coated onto complex three-dimensional surfaces. It is a key technology that can bring us closer to the commercialization of electronic skin for various applications in the near future."